This is a list of cities, towns and villages in Barbados. Barbados is a sovereign island country in the Lesser Antilles, in the Americas. It is 34 kilometres (21 miles) in length and up to 23 km (14 mi) in width, covering an area of 432 km2 (167 sq mi). It is situated in the western area of the North Atlantic and 100 km (62 mi) east of the Windward Islands and the Caribbean Sea; Many of the village names in Barbados are based upon the names of plantations. 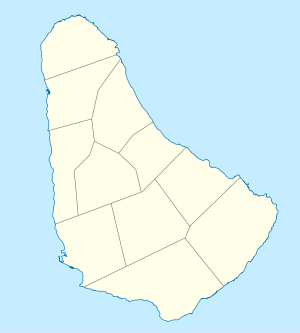 Barbados is divided into 11 parishes. ^ "Barbados". Insight Guides. 1998. p. 220. Retrieved 21 June 2016. ^ "United States Congressional Serial Set". U.S. Government Printing Office. 1965. p. 375. Retrieved 21 June 2016. ^ Howe, G.D.; Marshall, D.D. (2001). The Empowering Impulse: The Nationalist Tradition of Barbados. Canoe Press. p. 156. ISBN 978-976-8125-74-3. Retrieved June 21, 2016. ^ Barrow-Giles, C.; Marshall, D.D. (2003). Living at the Borderlines: Issues in Caribbean Sovereignty and Development. Ian Randle Publishers. p. 150. ISBN 978-976-637-148-7. Retrieved June 21, 2016. ^ Cameron, S. (2013). Barbados Footprint Focus Guide:. Footprint Focus Guides (in Portuguese). Globe Pequot Press. p. 48. ISBN 978-1-909268-32-6. Retrieved June 21, 2016. ^ Brandow, J.C. (1983). Genealogies of Barbados Families: From Caribbeana and the Journal of the Barbados Museum and Historical Society. Genealogical Publishing Company. p. 488. ISBN 978-0-8063-1004-6. Retrieved June 21, 2016. ^ Fodor's Barbados, St. Lucia, St. Vincent, the Grenadines & Grenada. Full-color Travel Guide. Fodor's Travel Publications. 2010. p. pt27. ISBN 978-0-307-92803-0. Retrieved June 21, 2016. 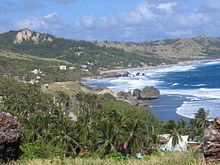 Wikimedia Commons has media related to Populated places in Barbados. This page was last edited on 7 March 2019, at 19:36 (UTC).